Parque del Retiro in Ponce has no monuments or statues like its renowned Madrid counterpart in Spain. Established in 1980 at an underprivileged town sector, it is a non-profit entity managed by the municipal government exclusively serving the City’s elderly population. Once known as Las Vegas for its popular open-air kiosks with 12 game tables, Parque del Retiro is constantly packed by the same group of joyful masters of the domino. Always in high spirits, the cheerful bunch relentlessly seems very happy and without any hesitation positively commends their much admired Roberto Castro Franceschi, Executive Officer in-charge of the daily operations. Bimonthly health clinics with a podiatrist and a general practitioner. Escorted transportation to their medical appointments. Especially adapted exercises and physical education programs, including strolls at many of the city’s passive parks. Guided cultural day tours to out-of-town attractions such as El Morro Fortress in Old San Juan, the Guavate Forest in Cayey and the thermal waters springs of Los Baños de Coamo, to name a few. Summer weekend long outings to the famed western beaches of Playa Santa and Boquerón. Annual Christmas, Thanksgiving, Holy Week, Mothers and Fathers Day celebrations. 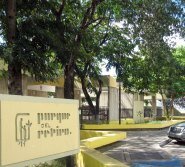 Social exchange trips to similar groups in the island, such as El Centro La Providencia in Loíza. Domino tournaments in which our masters gladly share their “tricks of the trade” with the younger crowds of the schools in the area. Talent shows and educational lectures of special interest to the mature population. Parque del Retiro was one of only five other island parks selected in a recent (November 2009) green reforestation effort sponsored by Telemundo, Doral Bank and the local Department of Natural and Environmental Resources of the Commonwealth of Puerto Rico. With a current population of 63 wise fellow participants, including 91 year old Patricia de la Cruz Vargas, the park proudly commemorated its 30th anniversary in a well deserved February 11, 2010 celebration with the brilliant Loíza Bomba Dancers and the local “pleneros” ponceños Los Guayacanes. The park is open to the public from MON thru FRI (8am-4:30pm).